The relationship between a designer and muse can be instrumental in making or breaking a model's career. No other designer has inspired such devotion amongst models as the pint-sized Tunisian-born French designer Azzedine Alaia. Alaia is as well known for his body accentuating, skin tight sculptural silhouettes as he is for the fidelity and enduring nature of his friendships with models like Veronica Webb, Linda Evangelista, Christy Turlington, Stephanie Seymour and Naomi Campbell to name but a few. In spite of having worked closely with some of the world's most recognisable beauties, Alaia's approach has always been one based on humanity. This perhaps is the key to why he is so adored and revered by his models. In an interview with luxuryculture.com, Alaia is asked the question "Do you have a muse? ", to which he responds "I don't like the word. Everything depends on the woman you meet and dress. If it's a woman it depends on her personality, not mine. There are girls who wear clothes so well that they're more than just outfits. When a woman who loves the clothes wears them it's really an expression of her personality, and that's more important to me than any muse." The close relationships between Alaia and his models have been well documented in the press. In an interview with American ELLE, Alaia reminisces about Linda Evangelista; "I just loved working with her. We felt like a family back then, because we practically lived together during the shows." Campbell in fact lived with Alaia in Paris during her early modelling days, and she along with Seymour refer to Alaia, affectionately as "Papa." In an interview with the Independent Campbell talks in depth about her friendship with Alaia, "My relationship with Azzedine is different from those I have with other designers, because he is the only one I've lived with. I call him "Papa" and we really do have a father-daughter relationship. He really taught me everything about the business, and also taught me even more important things about life - to be yourself, to do things with integrity and to do things from the heart. One of my best memories is of when I was so overworked at one point and I just called him up and he said, "Come home, ma fille! Come home!" He cooked dinner for me and put me into bed. Then, he called up my agency and said, "Stop overworking her. She doesn't need to be doing all of these things." It's that genuine love of his that's very special to me." 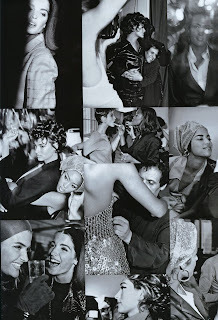 In March 2009, Seymour met with Alaia for a tete-a-tete for Interview magazine, "Azzedine may be the designer who best understands a woman's anatomy, which makes sense because he also is a man who understands a woman's heart and soul. I began collecting Alaia when I started modelling for him as a teenager, and I own pieces that continue to astonish me every time I put them on. He even designed my own wedding dress." Stephanie Seymour: "I have such fond memories." Azzedine Alaia: "It made me laugh when you first visited. You were 14 years old." Stephanie Seymour: "Yes I was. And I had never done a show in my life! I went on 20 go-sees around Paris and you were the only one who hired me. You even called your friends to try to persuade them to use me. Their response was, "Her rear is too round!" And your response was, "I think it's perfect." I was a total disaster in the shows. Your atelier was so small and you had to do three shows each day, so you just kept me on. That's when we became so close. You really took care of me, Papa." The loyalty towards Alaia amongst his coterie of models was no more apparent than when the designer's work was snubbed by the Met's "Model as Muse" exhibition. Alaia had been working on seven dresses for models including Naomi Campbell, Christy Turlington, Linda Evangelista and Stephanie Seymour to wear to the Met Ball Costume Institute Gala for the opening of the Exhibit at the request of the Met. When it became apparent that the designer's work and his contributions to fashion and the modelling industry would not be recognised, Alaia asked the models not to wear the dresses. Speaking with the New York Times Alaia elaborates that "It would have been silly to have seven girls wearing my dresses at the party and not have anything of mine in the exhibit." The opening party went on without Alaia and without Campbell, Turlington, Seymour and Evangelista in attendance. A spokesperson for Campbell issued the following statement "As Naomi has been the muse of Azzedine Alaia for 23 years, she feels she doesn't want to attend unless she can represent his work." Seymour issued the following statement "Azzedine has made my dress for every single ball. I had a fitting in Paris. But then he called me over the weekend and asked me not to wear the dress. I will still make my donation to the Met, but I won't be going."